Comments: Origin . Afghanistan, Pakistan and Russia. Popular in the Persian Gulf States. A tree of Royalty. Widely planted for screening, specimen use. Drought, heat and wind tolerant once established. Plant in dappled to full sun exposure. Does not tolerate wet conditions. pH range . 4.5to 8.5. 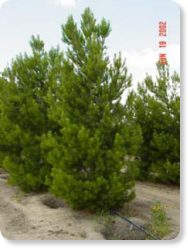 Produces 3" oval to oblong reddish-brown cones This is a great desert pine that tolerates heat, wind and drought conditions.